WARNING: This post includes documentation of most gruesome scenes at the crime scene. Click on artwork below to view the video. Warning for strongly sad document-images. – This video (click on the image above to view it. Video uploaded with VLC application) appeared on YouTube late night on the 14th May 2014 – uploaded by an account of name Brogorovic Ivan. I happened to be the first one viewing the video, so I shared the link in Twitter. Soon afterwards YouTube removed the video. I had managed however to capture it and saved it, and now I have publish the video in the Swedish-based site Libertarian Books – Sweden (Libertarianbooks.se), which is my own company (non-profit company, aimed to publish books online free, legal and ISBN registered). I believe it is legal, but if it isn’t, I will remove it. 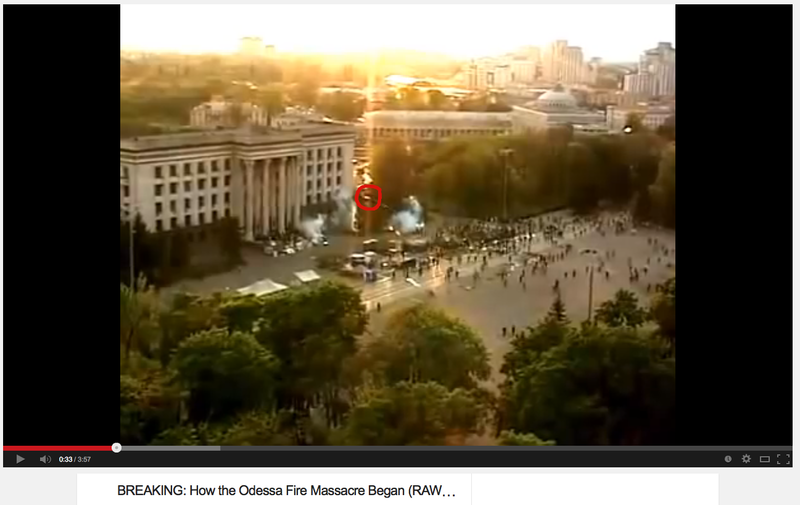 The still video below (see the whole video by clicking the image) shows, among other a) “Ukrainian activists” finishing up survivors that manage to scape the building on fire, killing them with baseball bats (man in circle on the image); b) a woman who survived is interviewed and confirms that the Ukrainian activists entered the building after set it on fire throwing some semi-asphyxiated people from the windows. Also explains that among the death found inside the building, some of them had bullet wounds. 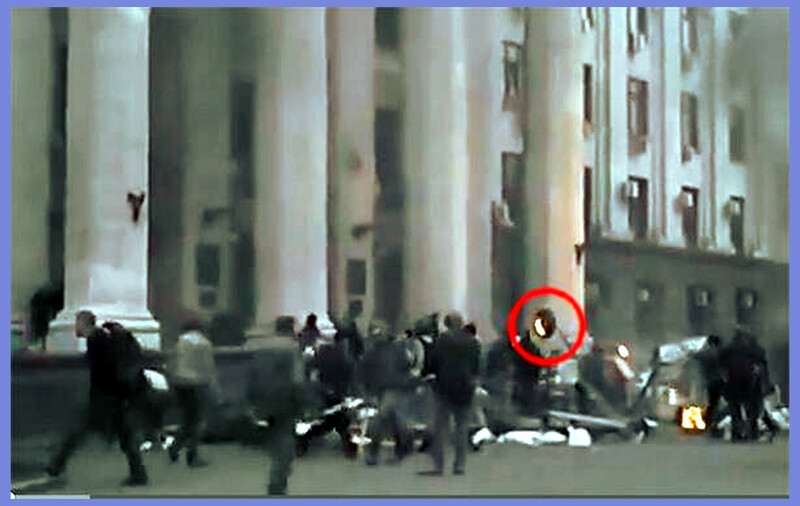 This still image corresponds to frame 0:40 of a video posted in YouTube, and which has not got much viewers (only 160 viewers up to this date) despite it was uploaded on the very 2nd of May. 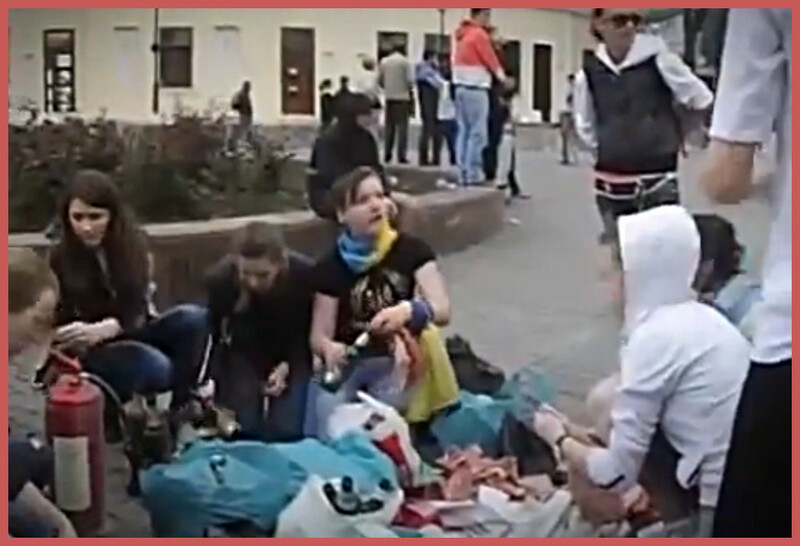 The video is call in Russian “В Одессе правосеки штурмуют Дом профсоюзов 02 05 2014 Украина”, which means (free transl.) 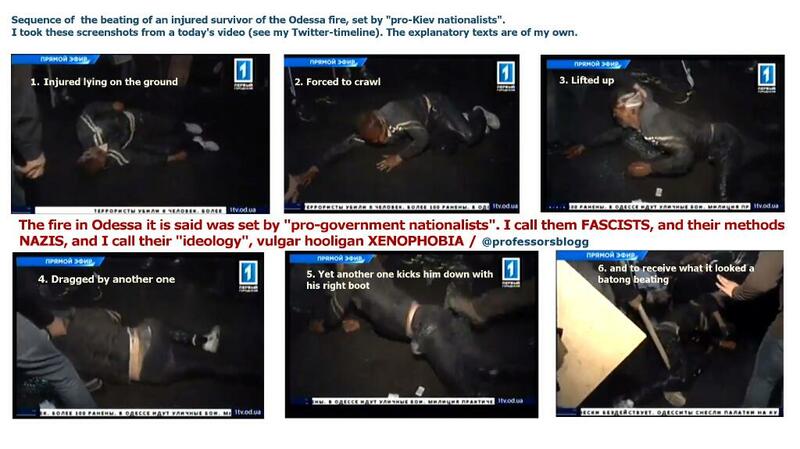 “Provocateurs storm the Trade Unions Building in Odessa, Ukraine, 2 May 2014.” The link provided to @Professorsblogg by Anna Shlyapnikova ‏(@shlyapnikova). ← Long Life To The Donetsk Republic! 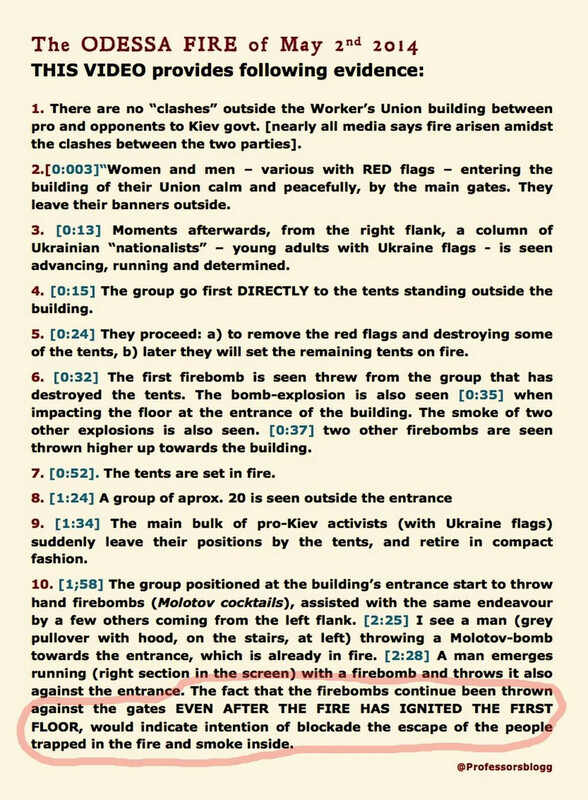 I don’t mean to nitpick, but as you make some serious criminal accusations here, please note that the women preparing molotov cocktails under heading “II” are located in Odessa center by Afina (Hrets’ka St.), where the “early” clashes took place, not Kulikovo Field, where the massacre occurred in the Trades Union Building. And yes I know, many blogs/reports have made this mistake ….